From badge holders to conference name tags, we have the item you’re looking for! It seems that most people these days don’t complain too much when wearing a name badge during events such as a convention or a conference. And there are so many reasons why they should be wearing them. 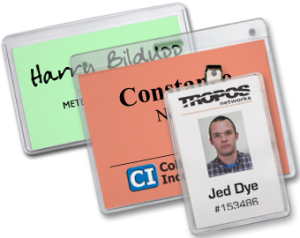 From security issues to just knowing a person’s name, name tags should be readily available for everyone to use. And, if you’re planning one of these conferences, getting the right name tag for your needs should be on your to-do list. So, here are a couple of pointers to choose the correct badge for your next event. Make a great impression at the next conference, meeting or seminar you host by providing name tags for each attendee. Networking is easy when everyone has a professional name tag, and the low cost won’t destroy your event budget. Adhesive name badges are a great item if you need a quick, single-use, short-term option. These quality sticky tags are great for writing or printing a name for easy networking. And they work for everyone, no matter what they are wearing. The adhesive will stick to most clothing and hold for a short event. Printable or writable for everyone to use. Available in five fun colors. Name badge holders are an event staple as they are frequently used for conferences, conventions, trade shows, meetings, schools and visitor passes. And, with printable inserts, they are easy to put together for a quick way to get people recognized at your next conference. These badges provide a more uniform look versus adhesive name tags. Use each tag with event swag such as lanyards or a badge reel. Several fastener options are available for wearing each name badge. Conference name tags provide an easy-to-use printed and laminated badge solution. And, readable identification will make all the difference in how well people interact at your event. 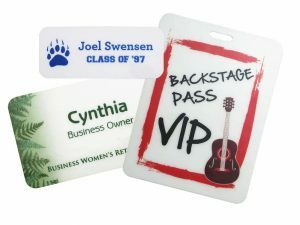 Print logos, graphics and more to make these name tags memorable. And, they are a bit more permanent than the other options. Easier to use and distribute than most other name badges. The lamination provides a unique, but professional style. Different fasteners are available for this look as well. So, no matter what you need for your quick, easy-to-use conference name badges, let us help!